Verbal Blend, a spoken word poetry program coordinated by the Office of Multicultural Affairs within the Division of Student Affairs, will host the annual Spoken Word Poetry Institute on Friday, Oct. 30, and Saturday, Oct. 31. Marc Rodriguez, Sammy Maldonado and Steve Alexandre from Good Vibes Creative Minds will perform and facilitate a workshop, along with 11 other spoken word poets. The events on Oct. 30 will include a panel discussion themed, “The Rose That Grew from Concrete,” along with mini readings by emerging poets of Good Vibes Creative Minds, Verbal Blend, Poets Learning Community and Nu Rho Poetic Society. The panel starts at 3 p.m. and will take place in 304 ABC Schine Student Center. The event is free and open to the public. Tickets are not required. On Oct. 31 at 11 a.m., members of Good Vibes Creative Minds will facilitate “Don’t Sweat the Technique,” a daylong workshop for writers and performers. It will be held in 304 ABC Schine Student Center. Students should register for the workshop by emailing Cedric T. Bolton at ctbolton@syr.edu. 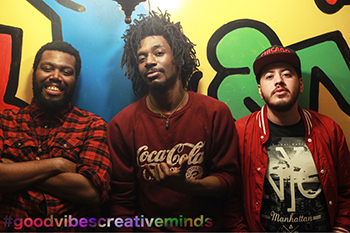 The institute will conclude with a live performance by Good Vibes Creative Minds on Oct. 31 at 7:30 p.m. in the Schine Student Center Underground. This ticketed event is free and open to the public. Tickets are available at the Schine Box Office. The third annual Spoken Word Poetry Institute is sponsored by Verbal Blend, with support from Nu Rho Poetic Society. Good Vibes Creative Minds founders Rodriguez, Maldonado and Alexandre came together with an idea to create a space for emerging artists. After going to countless open mics and live music events in the New York City area, they began thinking about an event they would want to go to. They wanted to bring some friends together just for one night with some music, poetry and good vibes. It truly began when Rodriguez offered his Harlem apartment as the backdrop. With Maldonado knowing all the top spoken word artists in the city, Alexandre having the production skills to put together a media department and Rodriguez having a vast reach in the Harlem arts community, Good Vibes Creative Minds was born. Since January 2014, the group has not only grown as the premier place to be for an open mic, live music, spoken word and live hip-hop experience, but has evolved into a brand that helps artists of all kind. For more information, contact Bolton at 443-9676 or ctbolton@syr.edu.